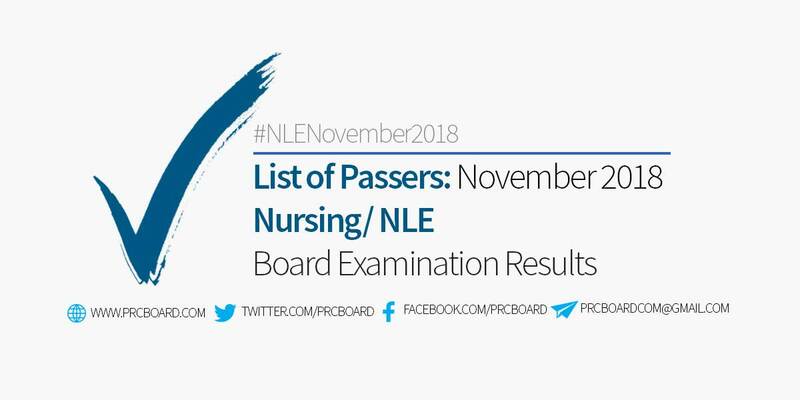 MANILA, Philippines (Released 12/07/2018) – The November 2018 Nursing Board Exam results or the Nursing Licensure Exam (NLE) including the list of passers, top 10 examinees, performance of schools, among other important announcements are available at this website as the Professional Regulation Commission (PRC) releases the results online 14 working days after the last day of board examination. As announced, 4,811 out of 12,033 examinees successfully passed the exams. As per PRC Resolution No. 2017-1068 series of 2017 or the “Schedule of Licensure Examination for Year 2018”, the target release date of November 2018 Nursing board exam (NLE) result will be in fourteen (14) working days after the last day of board examinations or by Friday, December 7, 2018. The computed release date is with respect to a declared nationwide holidays in November 2018, the Bonifacio day on November 30. On previous NLE exams, results were always released earlier than the target dates. On the most recent NLE conducted on June 2018, results were released after nine (9) working days. On November 2017, results were out after eleven (11) working days while on June 2017, results were out after eight (8) working days. The schedule of online appointment for issuance of Professional ID and Certificate of Registration will be from December 19, 2018 to January 11, 2019. As per BoN, the test draw basic knowledge, skills and attitudes in the major subject areas specifically in Fundamentals of Nursing including Professional Adjustments, Maternal and Child Nursing, Community Health and Communicable Disease Nursing, Nursing of Adolescents, Adults and Aged, and Mental Health and Psychiatric Nursing. Nursing is one of the programs with huge number of examinees being administered by PRC. To receive up-to-date news on Nursing Board Exam result 2018, we advise our visitors to bookmark this page, visit PRC official website, follow us at our social media pages via Facebook and Twitter or join the members discussions at our Facebook Group.